So Fraley, the guy behind the explosion in the use of glyphosate – the key ingredient in Roundup, which California just added to its official list of carcinogens – slams EWG for alerting Americans to toxic chemicals on produce? Sometimes the enemies you make say as much about you as your friends. Our annual Shopper’s Guide list of conventional fruits and vegetables with the highest and lowest residues of pesticide – after they’ve been thoroughly washed – comes from Department of Agriculture data. There’s really nothing complicated about the list. Some crops, like strawberries, apples and peaches have far more pesticide residues than others like sweet corn, avocados and cauliflower. Since most people would rather not eat a bunch of potentially toxic chemicals along with their produce, and some may not be able to afford an all-organic diet, researchers at EWG analyze the USDA tests and publish a free, up-to-date list each spring. Fraley’s blog makes much of the fact that both conventional and organic farmers use synthetic and natural pesticides to grow food. True. But there’s one thing Fraley and other critics always leave out when they scold us for telling consumers about pesticides on the food they grow: At least 50 synthetic pesticides once approved for use in conventional agriculture have since been banned by the Environmental Protection Agency, or phased out because of risks to health and the environment. Others are still used, despite growing evidence of their health and environmental hazards. Case in point: chlorpyrifos, which has been shown to cause brain damage in young children – even at trace levels like the residues the USDA finds on some fruits and vegetables popular with kids. Recently, EPA Administrator Scott Pruitt halted an expected ban of chlorpyrifos from use on food, without any valid scientific reason. His decision came shortly after he met with the CEO of Dow Chemical, which makes chlorpyrifos. Dow also gave President Trump $1 million to spend on his inauguration celebration. So what about those “natural” pesticides approved for use on organic crops Fraley referenced? How many of those been banned or phased out over risks to human health? Exactly one: rotenone, derived from the roots of tropical plants. Unlike chemical agriculture interests, who fight to the end when regulators propose restricting use of a dangerous pesticide, organic growers stopped using rotenone after studies began showing potential health and environmental risks. There are a number of significant differences between organic and chemical agriculture, and their respective impacts on health and the environment. You can read more about those here. Fraley goes on to cite research funded by the chemical agriculture front group, the Alliance for Food and Farming, or AFF, which has an entire website dedicated to attacking the Shopper’s Guide. Twisting the findings of the AFF-funded report by researchers with the Illinois Institute of Technology, he falsely claims the Shopper’s Guide is the reason “poor and working class people” aren’t eating enough fruits and vegetables. 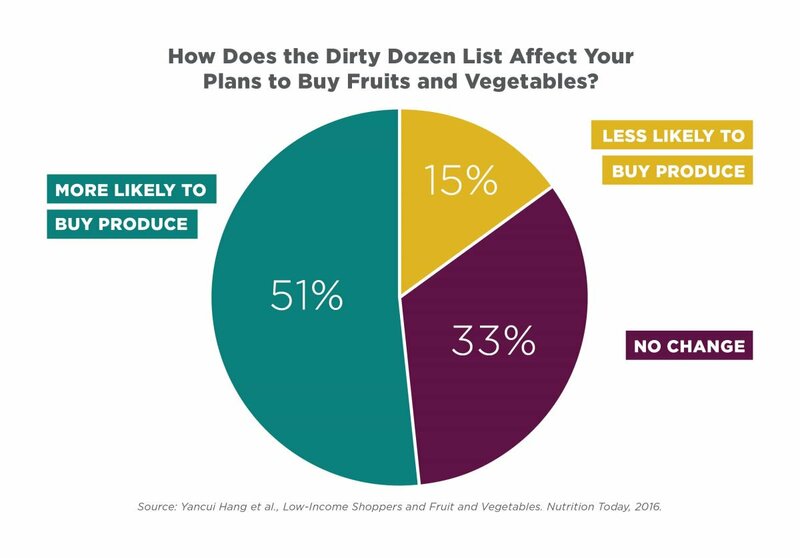 In fact, the study surveyed lower-income shoppers and found that after hearing about the Shopper’s Guide, they were actually more likely to buy fruits and vegetables. This pie chart shows more than half said the guide would make them more likely to buy produce and a third said it wouldn’t affect their purchases. Only 15 percent said they’d be less likely to buy produce. Public transparency on the chemicals it makes has never been Monsanto’s strong suit. There’s growing evidence of the company’s likely collusion with industry-friendly EPA officials to suppress information over the health risks of glyphosate. Monsanto’s rebranded itself as an agricultural conglomerate, but decades ago it made PCBs, cancer-causing industrial chemicals that continue to pollute rivers and bays, and lurk in more than 25,000 U.S. schools. Here’s the story of how Monsanto’s manufacture of PCBs contaminated Anniston, Ala., and how the corporation tried to cover it up. You can also see the incriminating documents and internal Monsanto memos, housed in perpetuity in EWG’s Chemical Industry Archives, which ultimately helped lead to the corporation’s $700 million settlement with the people of Anniston. Consider Monsanto’s sordid history and its shady practices today, and EWG’s 25 years of work to tell Americans the truth about hazardous chemicals in food, water, air and consumer products. Who do you trust to tell the truth about pesticides on your food?